Palm Beach, Florida Friday, December 14,1979 TWO SECTIONS s/>oc/..
study trip over the summer. weeks concluding on March 3.
enman Award to Henry L.
attorney in West Palm Beach. appointed Abe Bisgaier and Rev. country. Morty is a real lit. classroom and onto the stage. open meeting on Monday, Dec.
will entertain. All are welcome. She was founder of Hadassah. Roberta Black, or Mrs. Rudner. Monday, Dec. 17, at 12:30 p.m.
tions of an Astonished Rabbi." Ruth Streiner. All are invited. Hadassah, will be guest speaker. in Palm Beach on Dec. 20. W. Palm Beach, Fla. 33409 phiup weinstein, v.p. 1127 Lucerne Ave., Lake Worth. hold its monthly meeting on Dec.
Now two Chapels to serve you . ideal that transcends life itself. WEST PALM BEACH : 4714 Okeechobee Blvd. goal is before us; the JNF will chart the way." agency of Israel, from pre-statehood days to today. base for five million Israelis by 1990. Nations has legislated the accord out of existence. Khomeini's bidding in the case of the Shah. What can we expect from the United Nations? _ mittee for the Weizmann Institute of Science on Dec.
13 at the Eden Roc Hotel will be a unique occasion. a national badge of dishonor? Is Navon Aching to Quit Job? them a virtue rather than a fault. politics, where all the action is. for a rejuvenated Labor Party. to which he was elected. Worship Hour," on Channel 10.
lor his 25 years in the rabbinate. genes for the abnormal genes. cells of Cooley's anemia patients. Matzner, David Ross and Jerry Silverstein. appointment of Dr. Haviva D.
KINS KOLD always gives you more. University to work with Dr.
Cividalli as well as Dr. Bank, Dr.
when he walks into the future,"
Leadership Mission Oct. 15 to 28.
mind; how did anyone survive? gamut from bereavement to hate. suffered in Israel for 30 years." will be felt for generations." development town of Carmiel, in the northern part of Israel. use of expert speakers and workshops. Women's Agenda for the 1980's. i.onen, president; and Rose Slutsky. Assembly, introduces Brenda Shapiro, keynote. speaker for the day. i of Palm Beach County. Alan L. Shulman, president of a* _,, / .i. n, . challenges facing the Palm Beach they P>de fr *>" community. Women s A ssembly. heid Nov & at Th* Breakers. participation of all our members. of life for all people." Friday December 14,1979 Dinner: 6:30 p.m. Show: 8 p.m. I take mom and dad with him. uture and decided she wants to be a vet. Grand-mother Mrs.
litzvah party will be held at Temple Beth El. rork to be with their daughter. Ann-Lonnieand the baby. \ccoladea to the faculty at Florida Atlantic University. Dr.
hunger in order to eradicate it. tributions can be sent to P.O. Formerly of Roslyn, L.I., NY. 1st Place Master Grand Champion N.Y.C. Oa*a Days S Taaaewy TharMlay i.l ? too. Chex Party Mix. IT'S A MECHAYb'H! 1 cup salted mixed nuts. are coated. Heat in oven 1 hour. Wheat, Com, Rice or Bran Chex'cereals. Friedman, Max B. Shapiro, Bessie Hoffman, Abe Bisgaier, Victor Duke. for their assistance and support. Jack I. Chait, Shirley Fleishman. rally at the congregation Jan. 13.
general consul in Bombay. India.! immunity, Good Samaritan and Doctors' Hospitals. referrals to Chaplain Alan Sherman for unaffiliated Jewish patients. Temple Emanu-El where he is a trustee. 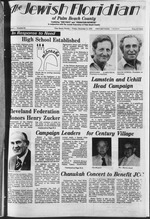 County, as well as UJA and B'nai B'rith. Beach, seven years ago. He is a graduate of New York University. What is worse, it fails to teach. boring given the same handicap. 90 MILES FROM WASHINGTON, D.C.
Camp nunlon tor old and new campers, Thursday Dae. 27,1979 at 7:30p.m. Tht story of Hanukah is. bosti Barbara Shulmon and Stava Gordon. s;n e ourselves and our people. times have changed all of this. which we Jews have of ourselves. W. Palm Beach Phone: 689-4675 Sabbath Services 9 a.m.
and 7:30 p.m. Daily Servioss8:15 a.m. and 5 p.m.
1600, 391-1111 Rabbi Benjamin Rosayn Fridays at 8:15 p.m.
p.m. followed by Oneg Shabbat. Saturday, 8:30 am., 5 p.m.
a.m. Dally Mlnyans at 8:45 a.m. and 5 p.m.
8:30 p.m., Saturday at 9 a.m.
[be recipients of this mitzvah. Dec. 16, from 10:30 to noon. ly feelings on the subject. of Chanuka presents at Chanuka. nature of the holidays, therefore. eye service. 24-hour emergency eye care service 96-7173.
ments accepted. Office hours Monday Friday. 9 5. Fran Golden at the piano. 10:30 to 11:30. Rabbi Irving B.
rate and improve comprehension. Call today. Monday thru Saturday 8-5 p.m.
Wednesday and Thursday till 8 p.m. INSTALL ALL TYPES OF DOORS. fNTERNA TIONAL 6403 GEORGIA AVE.
is a gift of light... and life. Altmark, ADL representative from New York. SHOP ALL JM STORES SUNDAY. 11 A.M. TO 7 P.M DAILY. 10 A.M. TO 10 P.M. The guest speaker was David distributes to Israels hospital. held hostage in the U.S.
any form," the resolution stated. Israel's official Red Cross service. Celler asked that those in. Lerested contact Mr. and Mrs.
Baloqh is offering OUR HIGHEST PRICES ever. Temple Beth Sholom "Latke Party"
- Chanukah Festival 7:30 p.m.
p.m. Temple Beth Sholom Sisterhood board 10 a.m.
Palm Beach County Region 9:30 a.m.
a.m. Women's American ORT Evening board 8 p.m.
Jewish Community Center -8 p.m.
Women Boynton board 1 p.m.
Women Golda Meir board 1 p. m.
Hadassah Chai 12:30 p.m. Hadassah Aliya 1 p.m. Program; and his wife Joan. month's program dealt with Who's a Jew." I nan 25 percent each year. Caih It Needed Now. Mort Than Ever. with the functions of the Council. to provide the initial leadership. Falik, Rose Fechter, William H.
Fund is moving into high gear. $100 for a single person. helping the Gibers and Mrs.
invited Friday. Dec. 21 at 11 a.m.
week of Dec. 17 for two weeks. Sunday. Dec. 23. at 7:30 p.m.
being planned. Space is limited. presents the Palm Beaches' IS. A. ages 12-16 and Division B.
Inn, 2830 South Ocean Blvd. The winter session will begin Jan.
Steinberg on Friday. Dec. 14. B'nai B nth Lodge 3041 Lt.
will hold its next meeting on Dec.
Schools" held in Arli igton, Va.
p.m. and is led by Sylvia Skolnik. Morris Rosen and Carl Sitzer. they will be at the CSSC on Dec.
on Dec. 18 at 1:30 p.m.
will present a variety of readings. Project Good Health: On Dec.
Cole, who are visiting the area. program will be Richard E.
National Bank of Palm Beach. Center no later than Jan. 10.
her missing husband, Eli, 24.
they knew each other socially. activities of the "Israeli Mafia." Fairfax area of Los Angeles. Lisa Small, daughter of Mr.
an^M Classman, >n of Mr.
Wei P ?V8' at TemPe ^rael. instances of crank or hostile calls. THE LIST of the "Mafia's"
16. Pictued above at the ribbon cutting ceremony are (1-r) Richard H.
Ivan Ward, store manager for the Palm Beach Mall Burdines. Hellmann's Real Mayonnaise. It even bakes! HELLMANN'S/BEST FOODS Real Mayonnaise. Because your Kosher kitchen deserves the best. were described by Dr. Stephen J. Office Hr.Mofi..Tu.. Wad.. Frt. 1hurs.Sat. Morris Engelberg to the board. with another Florida law firm. legal standing to bring action. (opposite Palm Beach Dodge) Okeechobee Blvd. OPEN DAILY 7 A.M. TIL 9 P.M.
liner, Drain & fin kit & water condltoner. is taking "a leave of absence,"
and in the United Nations. nedy chose him to be the U.S.
thing is done to interfere with it"
can join her in Israel. the Capitol, hosted by Rep.
Eric Warshal experiment with breaking down molecules. Union are saying, "we're afraid"
other Jews want to emigrate, too. vents are free of charge. II return to the temple at 4 p.m.
brunch is scheduled for 10 a.m.
on "Jewish Texts in the 1980s." wants the U.S. to "reasses"
to be handed over to Egypt. in Iran, it is clear that the U.S.
Are There Rights for 'Good Nazis'? the Studies of the Holocaust. come to the mission for help. Are there degrees of guilt? Chanukah giving it's the perfect gift! Coma in today! We will Lay a way! Jewish lawyers and Abe Dwek. delegation of the Legal Coalition. MM Po*n Beocn. Ronoo W*"
Party is illegal in West Berlin. tributed them to the patrons. ilie Cump David accords invalid. they will not suffer a similar fate. items is a criminal offense. Minimum Deposit $10,000. Simple Interest. Minimum Deposit $100. Compound Interest. AN AGiNCYOf THE FtDtRAl GOVIRNMEN! they knew were mostly Jews. picked up Christianity so fast. .
lead us to our Promised Land." know that all Jews aren't white." felt.' Just come right out with it. OF PALM BEACH COUNTY. INC.
PERIOD I 7 -7:46 p. m. PERIOD II 7:50-8:35 p.m. PERIOD III 8:40-9:26 p.m.
Group" claimed responsibility for the desecrations. Mayor of Leghorn and the city's Chief Rabbi. Leghorn Jews lost their lives in concentration camps. 3972 S. Military Trail, Laka Worth, FL. Mon. Fri 9 A.M. 8 P.M. Sat. 9 A.M. 6 P.M.
Nudel, and other long-term refuseniks. Soviet Embassy in Washington, D.C.
Angeles during June and July of 1980.
institutions on families in today's society. then serve a full three-year term. Charter provides for Israel's destruction. Beirut to assume control of the area. dune Yield: 6 to 8 serving*. a on your sent jar of Bright Day. conflict which was shown Nov.
General Joel Arnon, Joseph Molat. We Charge By The Room Not By The Square Feet!! A warm welcome visit our new office. our century birthday. Tefl us that you're with us. Tel u& 1HD 1B^ "more power to you!"